I’ve begun writing the first novel in the Carter Kovak mystery series. Carter and his wife Natalie are former intelligence agency employees. Carter worked for an agency that doesn’t exist anymore, he laughs and says, “…actually, it didn’t exist while I was working there….” Natalie worked for the FBI as a person who could find the answer to any question and provide the analyses needed to support the field agents. They met while working on a case together. I’m very excited about what these two will get into and how they will work their way to successful conclusions. This entry was posted in Emergence: Janus Unfolding Book One on March 13, 2016 by coreykn. 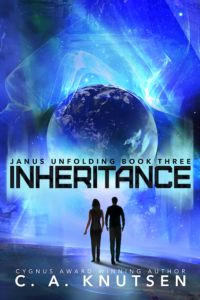 The first draft of the third book in the Janus Unfolding series, Inheritance is completed and in editing. The second book in the series, Emergence is now available in paperback. This entry was posted in Emergence: Janus Unfolding Book One on January 25, 2016 by coreykn. Whew! That took a while. This entry was posted in Emergence: Janus Unfolding Book One on October 12, 2015 by coreykn. Doing more weeding and reading, than writing. In the back of my mind, I am working on how to finish the third book in the Janus Unfolding series. I have tried to begin that work several times and it doesn’t come. I don’t want to force it so I’m Weeding and Reading. 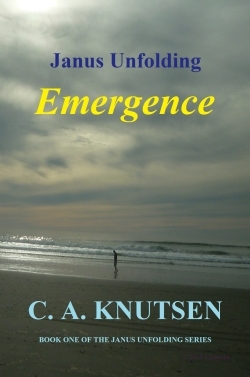 This entry was posted in Emergence: Janus Unfolding Book One on June 12, 2015 by coreykn. As I write the Janus Unfolding series, Arthur Clarke’s quote, “Any sufficiently advanced technology is indistinguishable from magic,” comes to mind. Suppose we are the less advanced people (easy enough to imagine that). Then ask: What would be so advanced relative to our experience to seem like magic to us? For example. Magic – Moving from one location to another instantly, perhaps without being seen in transit. Magic – All children are loved, clothed, fed, sheltered and given an education, and all women are treated with respect and empowered to fully participate in society. We may as well throw in that there is no more war or armed aggression and bullies do not prosper. What would we have to understand for the first one to seem common place? What would a world have to be like for the second one to be the norm? This entry was posted in Emergence: Janus Unfolding Book One and tagged Arthur Clark, emergence, indistinguishable, magic on April 22, 2015 by coreykn. This entry was posted in Emergence: Janus Unfolding Book One on April 15, 2015 by coreykn. The 1943 science fiction short story Mimsy Were the Borogoves by Lewis Padgett is about a toddler and his infant sibling who do things that are quite unusual. It is a story I am reminded of this whenever I see young children playing, unfettered by ‘impossibilities’ that are so obvious to adults. It’s not so much the specific story line as the concept that there is more to our existence than can be described by our senses and the associated four dimensions. In my writing, I present characters with something that is ‘impossible’ and then ask them to find out how such a thing could occur. I’m often surprised by what they come up with. This entry was posted in Author Notes, Emergence: Janus Unfolding Book One, Janus Unfolding Scifi Series on April 1, 2015 by coreykn. Is the Janus Unfolding Series Science Fiction? A genre title that is a better description of this series is Speculative Fiction. One reviewer thought Emergence was a ‘whodunit’ with a ‘dash of science fiction’. There is some ‘speculative’ science in my books. Just like faster-than-light travel which we all accept in our science fiction novels, the things I raise may seem impossible. I’m with the Queen of Hearts and Richard Feynman on the subject. I like to think of impossible things before breakfast and afterwards for that matter, and we don’t know it all. I recently encountered material presented by Nassim Haramein describing the exciting revelations he found by looking into what is in the empty space that makes up nearly all of the volume of you, me and the universe: Interesting point of view. This entry was posted in Emergence: Janus Unfolding Book One on March 24, 2015 by coreykn. I like the word transformative when I think about my writing. Transformative could be viewed as Creative-with-an-agenda – – conscious or unconscious. Transformation like Creation is saying that the desired result has happened. The transformation I have in mind for myself is likely a lifelong process. The transformation I have in mind for our species may take longer: Care for others, not fear others; Care for our world, not fear what might happen. In my writing, I introduce a change that puts ‘care’ ahead of ‘fear’. I believe we already have it in us to make this shift without the change I introduce in my books, but we fear and the media reinforces our fears. Thank you for visiting this new site. At this point I have only added things that I knew I wanted here. More will be added as I learn more about the art of websites and as my journey encounters other interesting things. This entry was posted in Emergence: Janus Unfolding Book One on September 29, 2014 by coreykn.